Hello everyone! It’s been . . . well, almost three months since my last post. Life has been hectic and unfortunately, the blog had to slide. It’s funny, but I’ve been meaning to start up blogging again for a while now. I was actually a bit worried about what my first post back should be about. Excuses for my absence? Memes to get back into the swing of things? Something to catch people’s attention? I should really stop worrying so much about things and just write. So here’s a review of the book I just finished. Blurb: In New York City, 1897, life has never been more thrilling-or dangerous. Finley Jayne and her “straynge band of mysfits” have journeyed from London to America to rescue their friend Jasper from the clutches of a devious criminal demanding a trade-the dangerous device Jasper stole from him… for the life of the girl Jasper loves. One false move from Jasper, and the strange clockwork collar around Mei’s neck tightens and tightens. From the rough streets of lower Manhattan to elegant Fifth Avenue, the motley crew of teens follows Jasper’s elusive trail. And they’re about to discover how far they’ll go for friendship. More than ever, Finley must rely on powerful English duke Griffin King to balance her dark magic with her good side. Yet Griffin is at war with himself over his secret attraction to Finley… and will risk his life and reputation to save her. I really enjoyed this book. 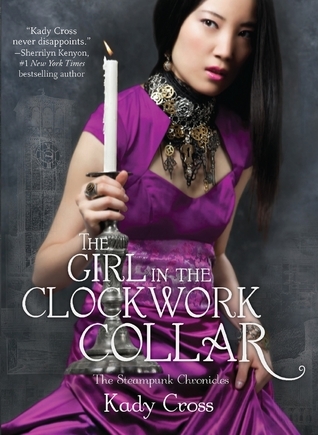 I liked the first one as well (review can be found here), but I have to say, the clockwork collar figured into the story a lot more than the steel corset did. I like Finley a lot. She’s a tough cookie who will let you know who’s boss. I also really like Emily – she’s adorable, but also completely brilliant. I’m excited to read the third book, since she looks to be pretty prominent. The change of setting was also nice. Y’all know how much I love New York City, so dropping some great characters in the middle of one of my favorite places is sure to win me over. Put that together with a truly sinister villain and a plot twist that I did not see coming, and you’ve got a pretty good book. Onwards to book #3!